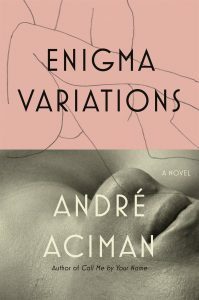 In Enigma Variations (FSG; $26), the latest novel from Lehman College alumnus André Aciman, the host of a Brooklyn dinner party wonders whether it’s preferable to be in that borough, gazing upon the Manhattan skyline, or on the island itself, looking at Brooklyn. “Oh, you sound like that tiresome author who’s always writing about being in one place and wishing to be in another,” scoffs a guest. In Enigma Variations, yearning for what one doesn’t have—and the question of whether getting it is destructive—is an explicit theme, elaborated through a series of “variations” or moments in the life of an urbane narrator named Paul. The novel—hailed by The New York Times as “a magnificent, living thing”—opens with a particularly gorgeous chapter in which Paul, freshly graduated from college, returns to the Italian island where his family spent each summer. Wandering the familiar streets, he recalls Nanni, the charismatic cabinet maker hired by his family. The 12-year-old Paul takes to visiting Nanni in his woodworking shop, where a schoolboy crush blooms into urgent, consuming love. Another chapter follows the adult Paul’s obsessive desire for a fair young German, which brings to mind Thomas Mann’s Death in Venice. Perhaps the most important variation foregrounds Chloe, a college classmate who Paul runs into every few years; each time, they take a stab at love. Now middle-aged, they sneak off for a few days to revisit the college campus where they first met. There, Paul explains that back then, he kept her at arm’s length because he was exploring another side to himself, with other young men, at night in the library’s stacks—a pure and urgent physicality. All of the novel’s enigmatic variations are animated by Aciman’s ability to render the subtle moments that become turning points in the protagonist’s journey of love. The flowing nature of desire alternately plays and mutes aspects of the melodies that form a human being’s identity. After all, the title pays homage to composer Edward Elgar, and Aciman’s “music in words”—to quote the Times review—reminds us that we are all varying melodies that can be played on different instruments.